Watched the last 5 episodes of Breaking Bad last night. What an incredible series. What incredible characters. What sublime, classless writing. It is a series the poshos in control of British media would have turned into Shameless or another "lets laugh at the hapless poor and working class." Isnt it brilliant our posho controlled writing talent is churning out another series of "Birds of a Feather?" World class. Can't wait for the new off spring of "Love Thy Neighbour" where a middle class arse tries to find common ground with his EDL and jihadist neighbours by joining UKIP with hilarious and everso slightly "its only good old British banter" racist overtones. 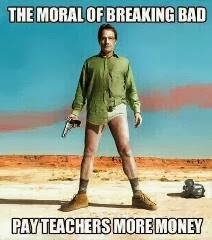 Breaking Bad is something uniquely leftfield, leftwing American. A superb dissection of insidious, almost inescapable capitalism. If you haven't already- go watch it. Bryan Cranston, the actor who played the very anti hero Walter White has played two amazing characters in the past twenty years. Two men trapped by capitalism. Two men who bumble and kick against the drudge of making money for someone else. Hal and Walter. Check out the anti-capitalist last episode of Malcolm in the Middle- an episode that brings a lump to the throat. Cranston plays these characters well- he is the product of something few in the UK escape to become sympathetic, empathetic working class actors - ie. Poverty. Working class actors in the UK are destined for middleclass sneering roles in which the lower order accent is used for comic effect or for Coronation Street or East Enders. All of the characters were well rounded. All of the dialogue incredible. "Look– look, you two guys are just… guys, okay? Mr. White... he's the devil. You know, he is– he is smarter than you, he is luckier than you. Whatever–Whatever you think is supposed to happen– I’m telling you, the exact reverse opposite of that is gonna happen, okay?" "You want me to beg? You’re the smartest guy I ever met, and you’re too stupid to see—he made up his mind ten minutes ago." "I did it for me. I liked it. I was good at it. And, I was really... I was alive." 62 hours of great telly. 62 hours of amazing dialogue. 62 hours of emotional, real characters. Lessons for life and lessons of writing.